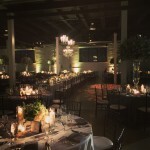 This week, we are looking back on how to create a traditional style wedding in a modern warehouse space. This wedding took place at Revel Fulton Market. By using a more traditional set-up, round tables, chivari chairs, elevated centerpieces and pin spots, we were able to create a more traditional style experience in this modern loft, all thanks to the team at Revel Decor.